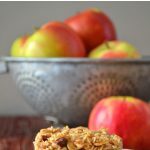 Make this Apple Pie Baked Oatmeal the night before, and pop it in the oven first thing in the morning! You’ll have a hearty, healthy and delicious breakfast! Good morning! Don’t you just love crisp fall mornings?! These are the kinds of days when a steaming cup of coffee and a bowl of hearty oatmeal is pure heaven! We actually don’t eat a lot of oatmeal during the summer months, so it tends to end up on our breakfast table come fall. There’s just something so comforting about it, and I love knowing that the kids tummies are full of good stuff. I must come by that honestly because growing up we ate a lot of oatmeal, or as we called it – porridge. My Dad would get up early on weekday mornings and have a big pot of it on the stove for us. I didn’t really appreciate it then, but I sure do now! I find our mornings too rushed and tiring to get a pot on the stove in time, so I like to prep the night before and put together an oatmeal for baking. 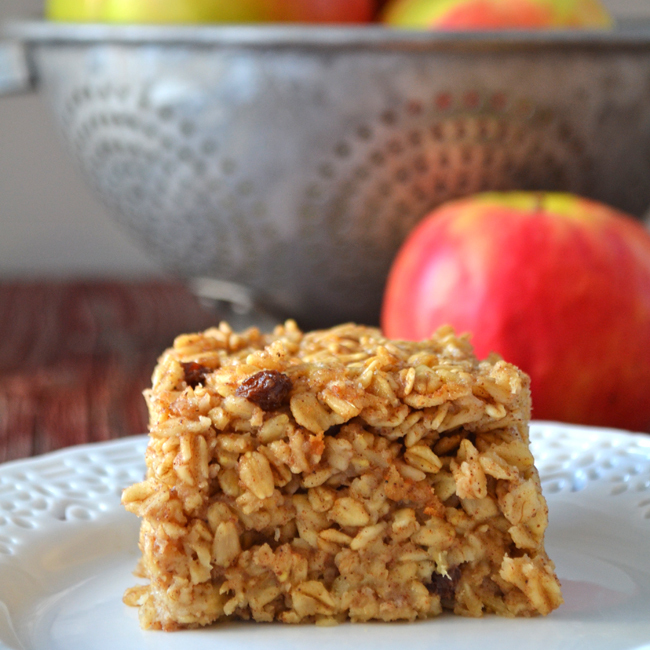 Baked oatmeals are the best! 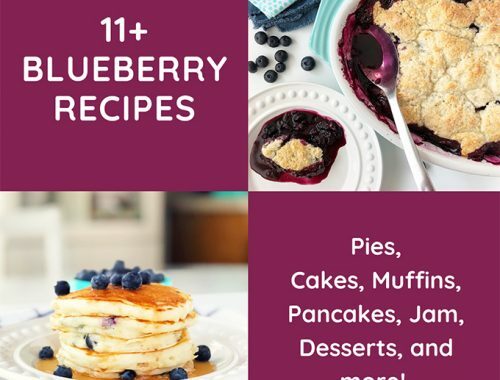 They are so versatile, easy to make and delicious! Last weekend I put together an Apple Pie Baked Oatmeal so I could get it in the oven on Saturday morning before we headed out for a busy day. It was sooooo good! Being able to have breakfast baking when you are getting ready to go somewhere is the best! When it’s ready, just serve it with a little milk or cream. Heaven. 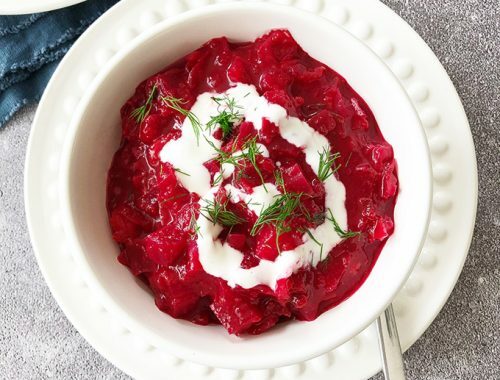 Baked oatmeals are also great for when you have guests over, because you make it the night before and put it in the oven first thing in the morning! It just really takes the pressure off in mornings! Love that! Whisk together eggs, oil, milk and vanilla. Then stir in apple sauce. In a separate bowl, whisk together oats, sugar, baking powder, salt and spices. Combine egg mixture and oat mixture. Pour into an 8×8 baking dish. Then cover and refrigerate overnight. In the morning, give the oatmeal a little stir. I found if you don’t do this, the egg mix tends to settle into the bottom. So give it a little stir. Then put the dish into a cold oven, and bake at 350 degrees for 40 to 45 minutes. – If you aren’t a fan of strong spice like allspice or cloves, you can omit them and just add more cinnamon instead (this is how I like it!). Or if you love spices, you can even add in some nutmeg. 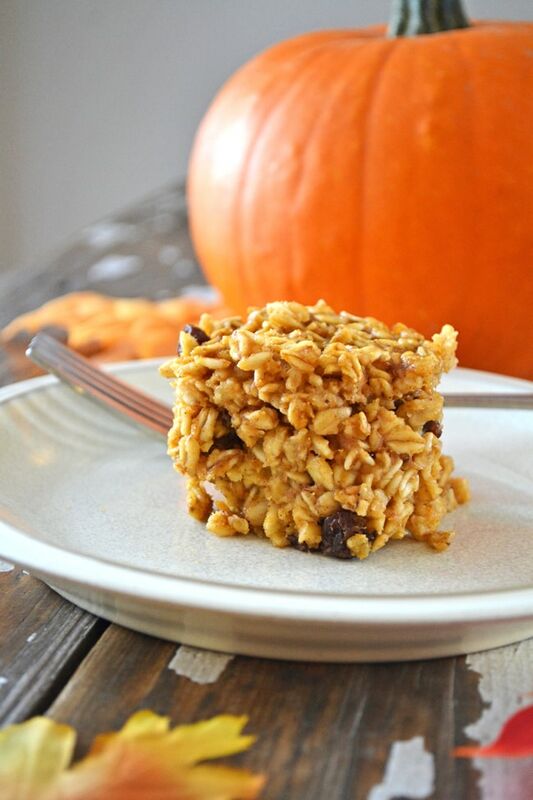 – You can cut the oatmeal into squares to serve, or just scoop it out as you wish! We also really enjoy my Pumpkin Spice Baked Oatmeal, it’s actually one of my most favourite breakfasts ever! Love your photography skills! You take such nice shots and all the props around it are perfect! Great work Jo-anna! Thank you SO much! It’s so hard to get good photos! I probably took 50 of this same pose, haha! Oh Joanna! This looks delish! My kids won’t eat mushy oatmeal but I am sure they`ll eat this. Thanks for sharing! I’ve never been an oatmeal girl (except cookies) but I am interested in this. How would you describe it in terms of texture? Is it more firm, like a soft, oatmeal-y brownie? Hi Kelley! I would call it creamy and soft…I like the texture of this better than mushy stovetop oatmeal… Hope that helps? I love baked oatmeal. I need to give your version a try. Pinning this and hoping my kids will eat it for breakfast. I know I will! 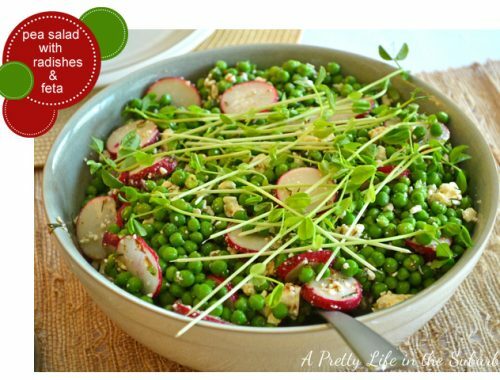 Kim was totally right about your recipes…ohgoodgolly this looks superyumful! We’re going on a farmers market tour so I’ve got to try this with fresh apples. Thanks for sharing the recipe! 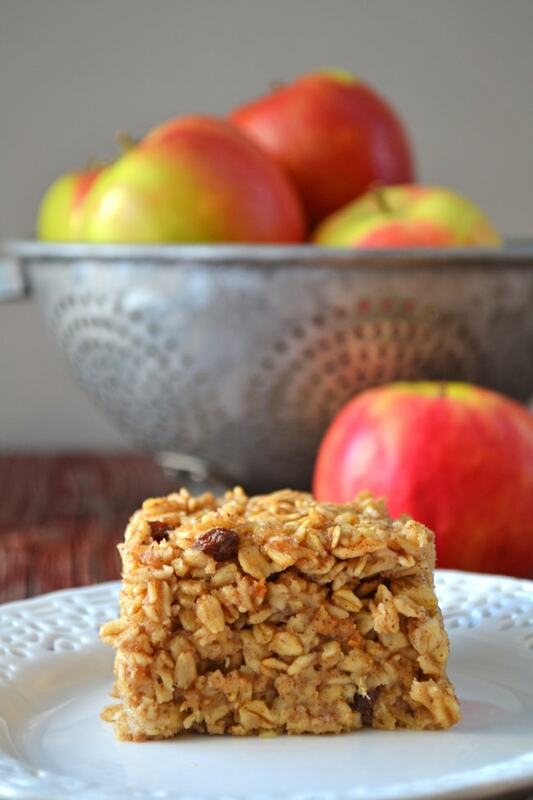 We absolutely LOVE apple baked oatmeal! This, and our pumpkin spice version, make appearances weekly at our house. We’ve even tossed in cranberries for a real treat. 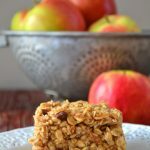 Thank you so much for the “Apple Pie Baked Oatmeal” and the “Pumpkin Spice Baked Oatmeal” recipes. I just found your site a few minutes ago and I’m so glad I did. I would use these for breakfast as well as dessert. I have type 2 diabetes and these will be very diabetes friendly. I have winter squash that I grew and prepared for the freezer this morning. I’ll be making the “Pumpkin Spice Baked Oatmeal” very soon. 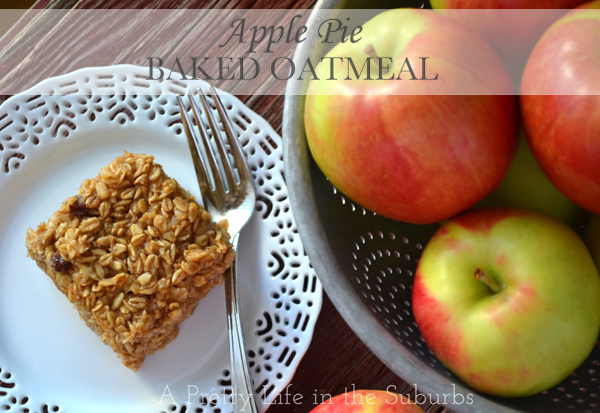 Also the “Apple Pie Baked Oatmea” very soon. Now to search through more of your recipes and great ideas. Do you cook it with the cover on?